But it is the accessory minerals that excite everyone, most of which occur within late-stage, course-grained pegmatites. Some are considered rare and include hastingsite (an amphibole), aegirine-augite (a pyroxene), magnetite, titanite (sphene), zircon, apatite, graphite, corundum, molybdenite, carbonates, sodalite, & cancrinite. One such known occurrence is within a small cleared area on the property of Flat Rapids Camp, who graciously permitted us access to collect for a small fee. We thank them for allowing us access to this small, but mineralogically interesting site. 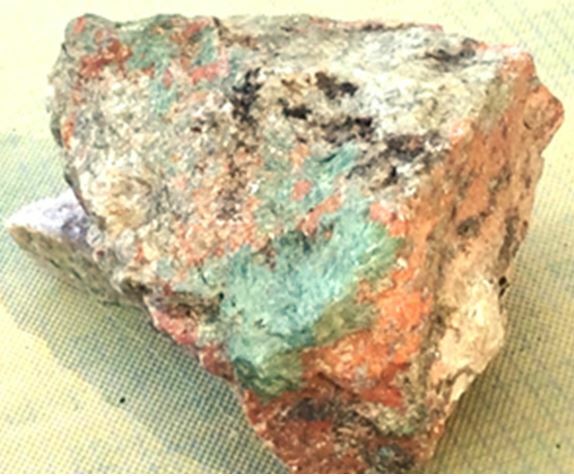 We did not find all the listed minerals for the site, but we did find really neat acicular green aegirine and bright orange cancrinite (see title photo), both in sufficient quantity for everyone to be satisfied. Sodalite was less evident on this visit than on my only previous visit in 2011 (the sodalite in the title photo is from the earlite visit), but small splotches of the bright blue mineral were available to collect. OK, the green is aegerine, but is the red nepheline or feldspar? One mineral perplexed us some in the field and still bothers me. The acicular sprays of green aegirine generally rest on a red mineral in the coarse-grained pegmatite, a very pretty red-green combination indeed. In the Mindat online description of the Rutter Pluton site, the red mineral is labeled nepheline. But there is also a grayish mineral seen in the rocks that looks more like nepheline to me. Furthermore, Sage (1997) lists potassium feldspar as a major component of the actual location where we collected and I wonder if the red mineral from the pegmatite phase of the Rutter Pluton might be feldspar? If anyone knows the composition of this mineral, I’d love to hear from you. Wilson, M., 2010, French River Occurrence, Bigqood Township, Sudbury District, Ontario, Mindat photo postings. (Link). For more and pictures on our Rutter Pluton visit, see Ashley’s 8 page post to the WCGMC club Facebook page.